Wow, this box is even bigger than the first! I rustle around and among the cabbage leaves I spy a bag of parsnips and two boxes of mixed bean sprouts. I haven’t cooked too many parsnips in my time and at this point I don’t know what I’m going to do with the bean sprouts . . . Meanwhile, I’m hungry and there’s a celeriac to use up so I take the largest parsnip, a couple of onions and some potatoes, and make another root veg gratin. 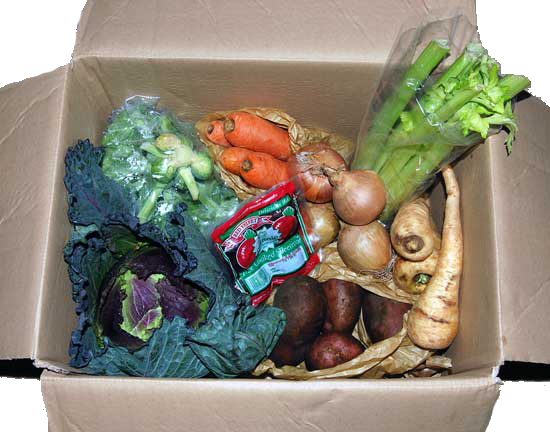 I have wanted to try a veg box scheme for ages, but wasn’t really sure about their value for money, so when I was lucky enough to win a box every week for a year I was well chuffed. I thought I’d write this blog to share my veg box experience with anyone else who is interested in veg box schemes, but aren’t quite sure. When the time came for my first box to be delivered I was dying to see what was inside. I knew that the box could contain anything – a selection of whatever was in season – so I knew that every now and then there would be something I hadn’t tried before or that I might wrinkle my nose at. I made a promise to myself that I would eat everything that arrives in each box, whether it be nasty, nice or new. Saturday morning came and through the cat flap I spied a cardboard box on my doorstep, which had been brought early by the milkman. I pulled it inside and opened it to reveal – urr (wrinkles nose) – turnips! Yuk – there’s my first challenge. But there was lots more besides: 1kg of potatoes, a pack of cooked beetroot, celeriac, 1kg of onions, garlic, carrots and a red cabbage. Most of these things would never feature on my shopping list – namely the beetroot, celeriac, turnips and red cabbage – so my diet is about to have a major revamp. I turned to the Internet for help with recipe ideas. Waitrose have an excellent recipe feature where you can search by ingredient and then save your chosen recipes in your own online scrapbook. 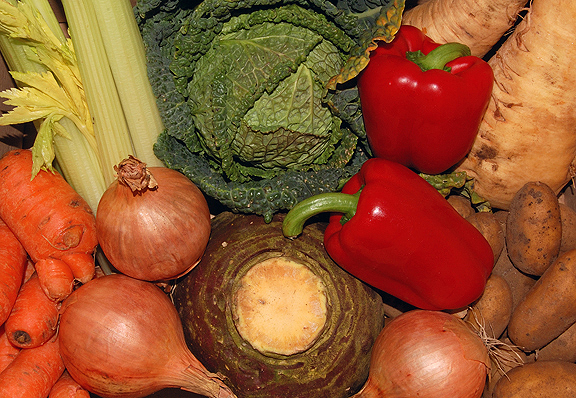 I found a tasty sounding Root Veg Gratin that would use the turnips plus some of the celeriac, potatoes and onions. Great! Then I found a beetroot soup that would use all of the beetroot and some of the onions. Fantastic! That’s two meals sorted. The carrots are destined to be dunked raw into hummus and garlic is something I use all the time, but what am I going to do with that red cabbage? So that is my first veg box and now I have seven days to eat it all up!